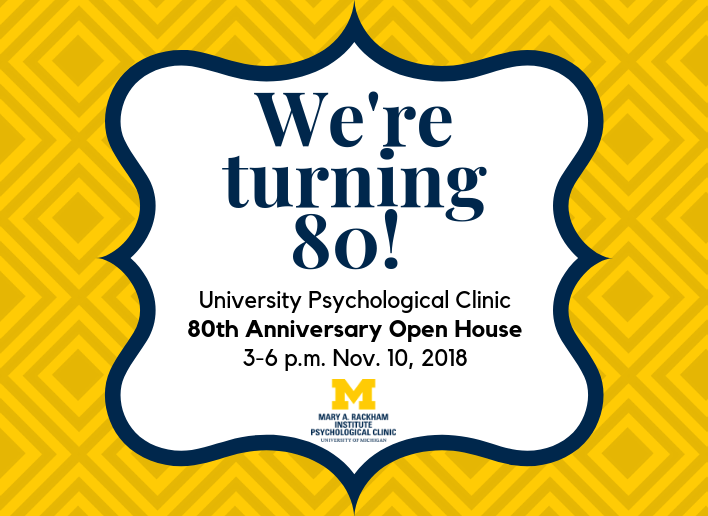 The University Psychological Clinic is celebrating its 80th anniversary of providing high-level services to the community and training generations of practitioners, and we want you to join us! This event is a chance for all of us to reminisce on the Clinic’s past and look forward to an exciting future. The Psych Clinic was founded in the 1930s and was incorporated as a part of the Mary A. Rackham Institute (originally named the Institute for Human Adjustment) at the University of Michigan in the 1940’s. Throughout the afternoon, alumni of the Clinic will have opportunities to share their memories of clinical work and training. Come to hear their stories and learn about the history of the Psychological Clinic through the decades. Looking forward, there will also be a chance to attend demonstrations of some of the new treatments being offered at the clinic. We are thankful to be a part of the university and the Ann Arbor community and we are ready for another 80 years. Food and drinks will be provided and the event is free to all. Please let us know you’re planning to attend by clicking the button below. We can’t wait to celebrate with you! What: An open house to celebrate 80 years in the community!